Can a Hair Transplant Cause Nerve Damage? Here at the DK Hair Klinik in Antalya, we like to make sure all of our patients, and all of our prospective patients, are fully informed on all aspects of having a hair transplant procedure. We’re always open to discussing any concerns and our blog is full of helpful advice, even on the things you’d rather not ask someone face to face. So one of the questions you might have could concern the risk of damage to the nerves in your scalp as a result of having a hair transplant. And the answer is, yes, a hair transplant can cause nerve damage to some degree. But with the right, skilled surgeon (such as ours) who fully understands the anatomy of the head and scalp, this is still quite uncommon. And if it does happen, then it is very unlikely to be permanent. So here’s a more in depth look at hair transplants and nerve damage. First off, it is useful to explain exactly how a hair transplant happens. We only use the Follicular Unit Extraction (FUE) method of hair restoration. This is far superior to the older, Follicular Unit Transfer (FUT) or ‘strip harvesting method’. This older, outdated method involves the surgeon removing a long, thin (about 1 to 1.5 cm wide) strip of tissue from the back of the scalp, known as the ‘donor area’, roughly from ear to ear. This piece of tissue is then dissected under a microscope and the ‘follicular units’ (small pieces of tissue containing healthy hair follicles) separated out. The surgeon then makes small holes all over the area to be treated, known as the ‘recipient area’. The extracted follicular units are then transplanted back into these holes within the balding areas, usually across the top and front of the scalp. The wound at the back of the head is then stitched up. Our advanced FUE method on the other hand involves the surgeon removing individual follicular units from the donor area using a specialised punch tool. There is no need to remove whole strips of tissue. The surgeon will then transplant these follicular units directly into the donor area. It is far less invasive, results in less scarring and produces a more natural final look. These tiny little nerves run fairly close to the surface of the skin, and this is why it can be possible to damage them during any kind of surgery, not just hair restoration surgery. If you accidentally cut yourself fairly deeply, then you run the risk of nerve damage. The same can be said for a hair transplant of any kind. Although all highly skilled, respected and registered hair surgeons will do their very best not to cause nerve damage, it is still a risk. If nerves are damaged during a hair restoration procedure, its considered a fairly minor injury. Nerve damage (known medically as paraesthesia) results in a numbness of the skin, and sometimes causes a burning or prickling sensation where the nerves have been damaged as they start to repair themselves (as nerves are clever little things!). So What About Nerve Damage During a Hair Transplant? It’s understandable that you’d be worried about nerve damage given what a hair transplant involves, whichever method, FUE or FUT, you have. But let us reassure you again, long lasting nerve damage is quite uncommon. But short term numbness can be a side effect of the procedure. A certain amount of numbness in the days after a hair transplant is normal. This is because you’ve had a local anaesthetic applied to your scalp and also because of the nature of the procedure. Your scalp has gone through a fair amount of trauma (all for good reason of course) and it needs time to settle down. You can experience numbness in both the donor area at the back of your scalp and the recipient area at the front, top and sides of your scalp. Any kind of nerve damage, short or long lasting is more common in the donor area at the back of the head after the older FUT strip harvest hair transplant method. This is because the piece of tissue removed is so much larger than during the newer FUE method, putting the scalp more at risk of nerve damage. But even if you did go to a clinic still performing the older FUT method of hair restoration, if done properly, any nerve damage that does occur should right itself within six or so months. The same goes for any nerve damage as a result of having the more modern, FUE, method of hair transplantation surgery. 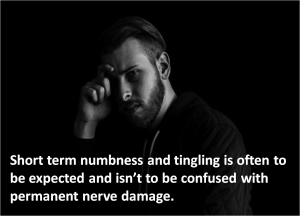 Short term numbness and tingling is often to be expected and isn’t to be confused with permanent nerve damage. Even though it can take two to six months for the normal sensations in your scalp to return. Once it does start to return, you’ll notice the normal signs of healing such as itching, tingling and prickling – think back to scabs on your knees when you were a child, and how they felt as they were healing. And the advice is the same now, as it was then – if you don’t want permanent scars, then resist the urge to scratch and pick at your scalp! You might even experience mild electric shock feelings, but these are rare and part of the normal process as nerves begin to repair themselves. How Can I Help Prevent Long Term Numbness and Burning? To reduce your risk of any complications such as infection or the transplant not working, as well as preventing numbness from lasting more than a few weeks or months, it’s crucial to follow your surgeon’s advice. We send all of our patients’ home with post-operative instructions. These include advice on how to care for your scalp, when you can begin to get back to normal life and what you should and should not be doing in the first few weeks. It’s also crucial to make sure you only have a hair transplant procedure under the care of a registered clinic and qualified and experienced hair restoration surgeon. If after six months your scalp still feels numb, then it’s a good idea to arrange to see your surgeon. This is especially important if you’re also experiencing pain, bleeding or excessive crusting on your scalp. In extremely rare cases, nerve damage resulting in permanent numbness can occur on some areas of the scalp. If this happens to you, your surgeon will be able to talk you through your personal circumstances. At the DK Hair Klinik, all our hair surgeons and medical teams are highly skilled, qualified, experienced and registered with the relevant health bodies that regulate and monitor our service. 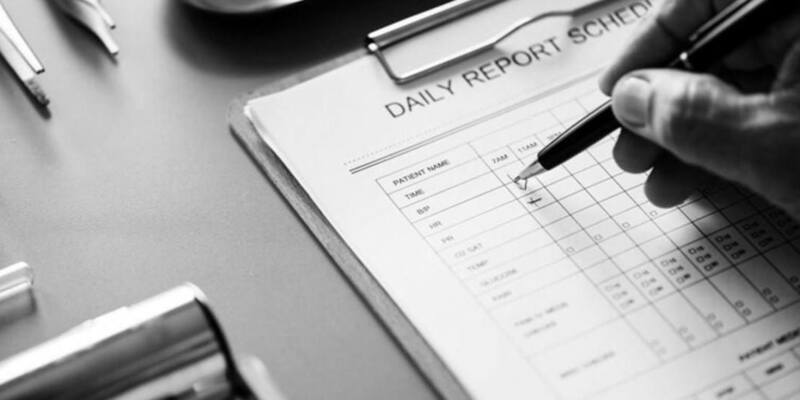 If you’d like to discuss your hair transplant with us, fill in our free online consultation form today!